There is a legend in Burma stating that swarms of male dragonflies gather to join in choruses of high-pitched tones to court their mates. The ones that don’t succeed in mating eventually scream so loud that their chests explode and they drop dead to the ground. These recordings are a tribute to this legend. Droning cicadas, dragonflies and other insects display their charm as masters of the High Frequency Airwaves recorded live and unprocessed by Tucker Martine in the lush settings of Laos, Thailand, and Burma. 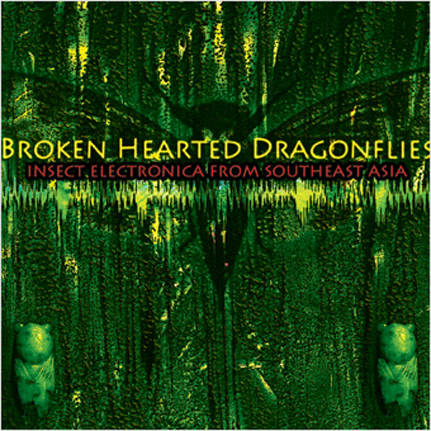 Enter the supernatural world where Entomology and Electronica converge in a tropical hallucination of alien sound. Anyone who’s ever wondered if these strange symphonies could be recorded or preserved AS precisely as they sound in the field need look no further! Martine has done it and you will be transported to the exact experience one would encounter in these mysterious lowlands. Liner notes by Hakim Bey!